“And understand this above all else: spiritually speaking, success is not measured by what we own, our accomplishments, the amount of money we have or what we look like. Success, when speaking spiritually, is measured by how much we’ve learned.” – Bram Levinson. I have this vision in my head of myself, 20 years down the road, on a winter day opening a jar of tomatoes that we grew and canned the previous summer. Making stew and feeding my family. Pulling a loaf of fresh sourdough out of the oven and grabbing some potatoes and leeks from the basement. Hopefully the winter has been kind enough to us to leave a few stalks of kale out in the yard. There’s a fire going and maybe even a glass of wine on the counter. The house is probably a mess and I’m still learning to be ok with that for the sake of my own sanity. In my mind it is peaceful, but in reality we know there will be dishes in the sink, a dog needing a walk and a tomato stain down the front of my shirt. Hectic, real, full of life and love. It is in this moment that I want to measure my success. I guess I am a bit of dreamer. Focusing my goals around these little tidbits of a future life. But for me that’s where it starts. Maybe you have your goals laid out in front of you, and you can easily connect the dots from one to the next, seeing success along the way. Way to go. I must admit I’m envious of you. I’d love to learn from you. I’d love to learn so many things this year; to be kinder with my self, to have confidence in my own decisions, to trust my gut, to compare less and live more. To love wholeheartedly. So instead of wondering what we can achieve this year, could we, maybe, focus on what we will be able to learn? And measure what we know as success, not in moments of triumph, but in how we face and find happiness in our day to day. 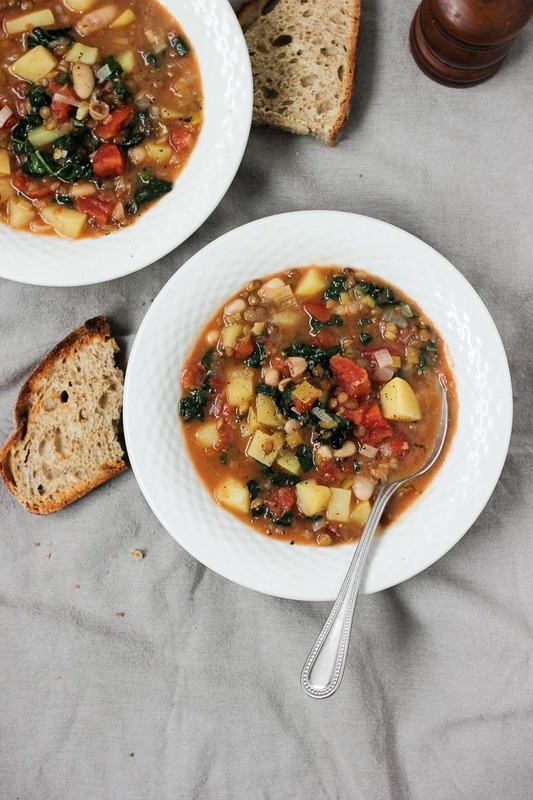 May this year bring you moments of courage and quiet nights with bowls of winter vegetable stew. 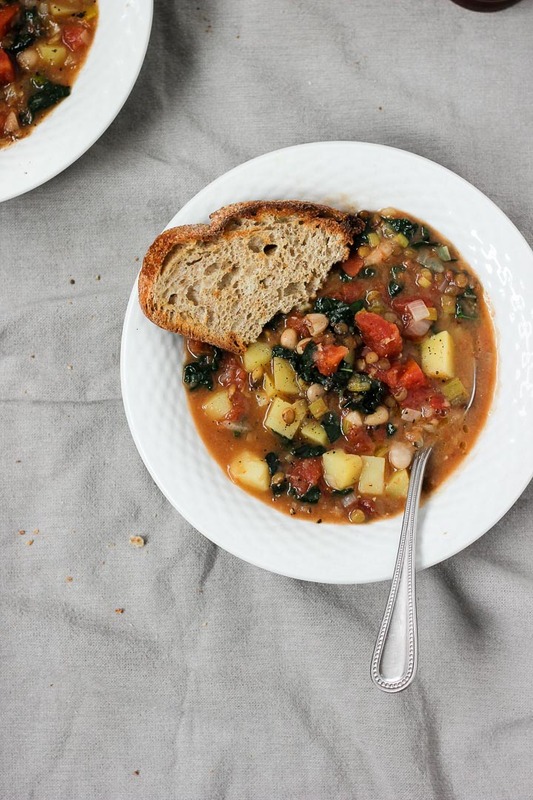 A winter vegetable stew has always been one of favorite meal during the cold months. For years I kept going back to this one – comfort in a bowl and fond memories of France. All good stews must have potatoes, says Matt, and in this case I must agree. Adding potatoes to stew, even if just a small amount, will help makes things thick and hearty. The longer you let this one cook, the better it gets. Once you allow the potatoes to melt right into the stock, you get this brownish delicious bowl of winter nourishment. Serves 6. Vegan + Gluten Free. Warm oil in a heavy bottomed pot over medium heat. Add onions and leeks and sauté until soft. Season with a dash of salt and pepper. Add garlic and stir to coat in oil, cooking for a minute or two. Add potatoes, beans, lentils and herbs. Stir to combine. Add tomatoes and vegetable stock. Stir together and bring to a boil. Reduce to a simmer and cover. Cook until potatoes are soft, about 30 minutes then add in finely sliced kale about continue cooking for 10 minutes. Simmer uncovered towards the end to reduce liquid if there is too much. You can simmer it for longer for more of a stew-y consistency. Taste and adjust salt and pepper as needed. Beautifully said! Learning is a victory in and of itself.